You’re a small business ready to advertise on the Yahoo! Bing Network. You’ve read Simone Schuurer’s PPC Back to Basics Part 1 – Why You Should Care about PPC , The difference between Search Engine Optimization (SEO) & Pay Per Click (PPC) and even how to create a good account structure and you are ready and eager to put your business out there for the world to see. Let’s make it happen! Setting up a campaign only requires a few main steps, and we offer an array of support resources. Take a peek at the overall process flow below to get your bearings. 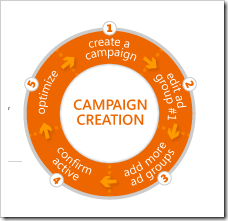 This post will focus on #1: Create a Campaign. Sign in to Bing Ads. If you don’t have a Bing Ads account, sign up by filling in a brief, 1/2 page online form. 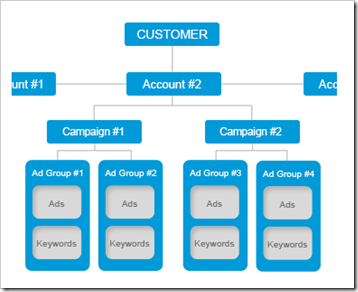 When complete, you’ll have access to the Bing Ads campaign management tool (previously known as adCenter, now Bing Ads), which advertisers use to create and manage their search advertising campaign, and which we’ll be explaining below. This entry was posted on Wednesday, December 5th, 2012 at 7:16 am and is filed under Microsoft Advertising Community, PPC News. You can follow any responses to this entry through the RSS 2.0 feed. You can leave a response, or trackback from your own site.